An optical viewfinder offers the most comfortable, accurate and efficient operating experience by showing a bright and sharp full color image through the taking lens. Since they exhibit no motion blur, judging focus during movement is easy, which can save hours of aggravation and re-takes. With electronic viewfinders, the image from the imaging sensor always needs processing before it can be displayed in the viewfinder, resulting in a delay that is under one frame with the ARRI electronic viewfinder EVF-1 and that can be up to multiple frames with other electronic viewfinders. A delay of multiple frames can be especially confusing when shooting music videos or remotely operating on a crane. Optical viewfinders show natural motion portrayal, accurate color fidelity and proper white balance, i.e. that of the scene. Operators see exactly what is happening as it happens and experience less eye fatigue. Cinematographers appreciate the ability to judge lighting through the viewfinder and to work with the camera even when it is powered down since choosing lenses, blocking, setting up shots, pre-lighting or rehearsing before the camera is powered up can save precious time on the set. For those situations, where the image is simply too dark for the optical viewfinder to see, the ALEXA XT Studio can be quickly equipped with the ARRI electronic viewfinder EVF-1. A mirror shutter is a mirror, located at an angle in front of the sensor, that continuously rotates. Half the time it reflects light up into the optical viewfinder and the other half it lets light fall onto the sensor. 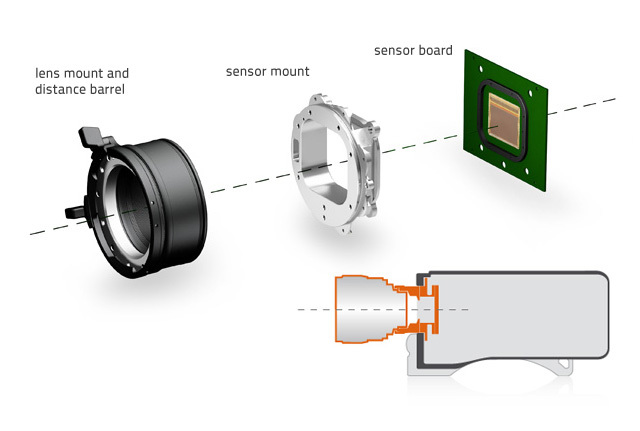 Thereby the mirror shutter makes the optical viewfinder possible and determines the exposure. The advantage of a mirror shutter is two-fold: on the one hand it does not exhibit the rolling shutter artifact of electronic shutters, and on the other it provides a natural motion portrayal that is exactly as it was with film cameras. A sealed sliding mechanism places either an optical clear or an ND 1.3 filter (4.3 stops) behind the mirror shutter in front of the sensor. The ND 1.3 ensures a bright image in the optical viewfinder while only attenuating the light hitting the sensor. 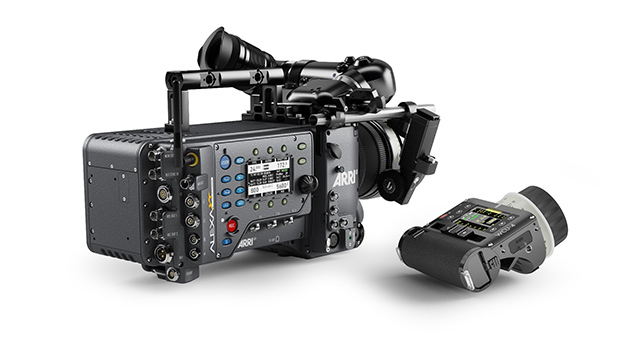 With its built-in radio and lens motor electronics, the ALEXA XT Studio makes working on the set faster and more efficient. 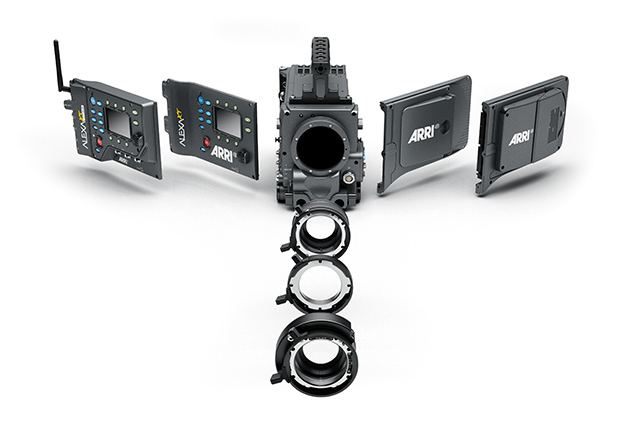 Plug the ARRI lens motors directly into the camera, turn on the wireless hand unit (like the WCU-4) and off you go. Integrating the wireless and lens control infrastructure into the camera not only saves time, but also weight, as a setup with an ALEXA XT and an external motor control box would be more cumbersome to cable and heavier in sum. 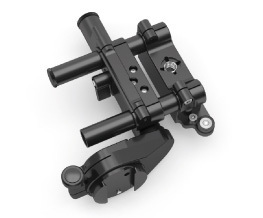 Compatibility with the ARRI hand units, like the WCU-4, as well as with the cmotion hand units makes this a supremely flexible tool. The Electronic Viewfinder EVF-1 can be used on the ALEXA Studio instead of the Optical Viewfinder OVF-1 with the use of an adapter. To provide maximum comfort for the operator, the Viewfinder Mounting Bracket VMB-3 is strong and rigid, which has been achieved through a complete re-design of the previous model and the use of two 15 mm lightweight rods. These rods also facilitate rapid changes in camera support, i.e. from a tripod to a crane or Steadicam, since accessories such as lens motors or follow focus units can be hung from them rather than cluttering up the base plate. A special anodizing process is used on all moving parts for a very hard yet low-friction surface and a bubble level allows for speedy leveling of the camera. 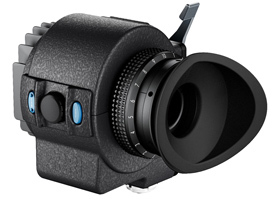 This viewfinder was specifically designed to meet the needs of professional camera operators by offering an extremely low latency image display, high image quality, accurate color reproduction and a number of features inherited from our optical viewfinders, including a peripheral viewing area we call ‘Surround View’. It can be used on the ALEXA Studio instead of the Optical Viewfinder OVF-1 with the use of an adapter. Operating Modes Mirror shutter on or off. Switching takes approximately 3 seconds.16:9, 4:3 Full, 4:3 Cropped or Open Gate sensor modes. Switching takes approx. 60 seconds. 16:9 available for ARRIRAW, ProRes and DNxHD recording. 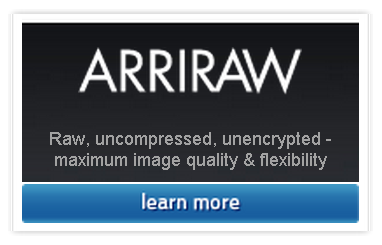 4:3 Full available for ARRIRAW and ProRes 2K recording. 4:3 Cropped and Open Gate available for ARRIRAW recording. Filter Permanent filters in front of the sensor: optical low pass, UV, IR. There is also a sealed behind-the-lens motorized filter mechanism that provides an optical flat or ND 1.3 (4.3 stops). Sound Level Under 19 db(A) while recording ProRes 4444 16:9 HD @ 24 fps (mirror shutter running) and ≤ +30° Celsius (≤ +86° Fahrenheit) with lens attached and fan mode set to ‘Regular’, measured 1 m/3 feet in front of the lens. Silent operation at higher temperatures possible with fan mode set to ‘Rec low’. Power In Three possible inputs: BAT connector, optional battery adapter back or optional battery adapter top. All inputs accept 10.5 to 34 V DC. 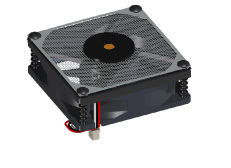 When running over 30 fps with mirror shutter on, voltage of 18V or more is recommended. 95 W power draw for camera and OVF-1 in typical use recording 24 fps to SxS PRO cards at room temperature, mirror shutter on, without accessories. Weight ALEXA XT Studio body with XR Module: 8.3 kg/18.3 lbs. ALEXA XT Studio body with XR Module, optical viewfinder and handle: 10.5 kg/23.1 lbs. Environmental -10° C to +45° C (+14° F to +113° F) @ 95% humidity max, non-condensing. Splash and dust proof through sealed electronics. System cooling through radiator/single fan. Lens Mount 54 mm stainless steel LDS PL mount, Super 35 centered. 52.00 mm nominal flange focal depth. Assistive Displays For OVF-1: Warning LEDs for REC (recording), BAT (battery low), FULL (XR Capture Drive or SxS PRO card full).For EVF-1 and MON OUT: preset and custom frame lines, user rectangles, surround view, 180º image rotation, camera status, false color exposure check, peaking focus check, electronic horizon, compare stored image with live image, RETURN IN video and anamorphic de-squeeze. For MON OUT additionally: Reel & clip number. Control Camera right: Main user interface with a 3” transflective 400 x 240 pixel LCD color screen, illuminated buttons, button lock and jog wheel. Camera left: Operator interface with illuminated buttons and button lock. Camera acts as a web server, displaying the ALEXA Web Remote on web browsers of computers connected to ETHERNET connector. MIRROR PARK buttons: VIEW/GATE. Optional accessory Remote Control Unit RCU-4 for cabled remote control via camera ETHERNET connector. Optional accessory Wireless Compact Unit WCU-4 for wireless remote control. 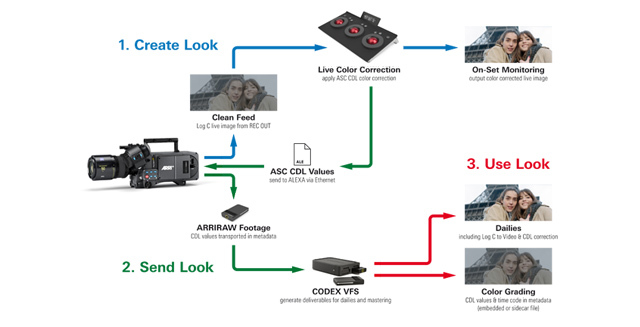 Synchronization Master/Slave mode for precision sync of settings, sensor, processing, HD-SDI outputs and QuickTime/ProRes or MXF/DNxHD recording for 3D applications. PHASE user button for synching camera phase to an external source, like a CRT monitor or rear screen projector (works in Rec Run TC mode, with mirror shutter on and off). Upgrades The Storage Interface Module can be exchanged for future storage modules. The Electronics Interface Module can be exchanged for future control electronics. An easily exchangeable lens mount allows other lenses beyond PL mount lenses to be used. 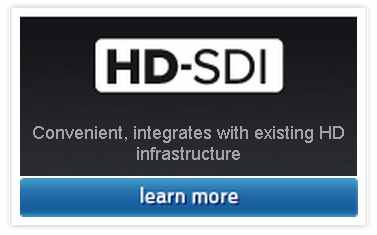 Simple camera software updates via free of charge Software Update Packets (SUPs) and payable license keys – Anamorphic De-squeeze (included), High Speed (included) and DNxHD (included). (1) Frame grabs are not possible during High Speed, 16:9 2K, 16:9 3.2K, 4:3 2K, Open Gate or when the option “REC OUT = MON OUT Clone” is chosen. ALEXA XT Studio is compatible with and requires ARRICAM ground glasses and frameglow masks.For more details, click here. Small size, high performance, high reliability industrial grade solid state drive technology in a rugged aluminum enclosure.For more details, click here. 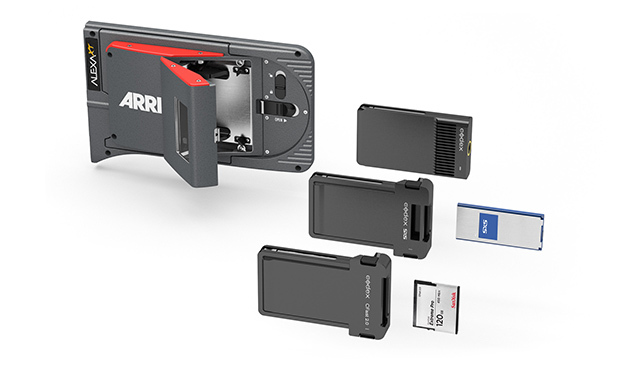 Small docks that accept a single XR Capture Drive, Capture Drive for Onboard S or Transfer Drive.For more details, click here. A dock that accepts two XR Capture Drives, Capture Drives for Onboard S or Transfer Drives.For more details, click here. An adapter that fits into the ALEXA XR Module for holding one CFast 2.0 card.For more details, click here. Small size, high performance, high reliability professional grade memory card with pin-less design.For more details, click here. A professional high quality and high reliability CFast 2.0 card reader that accepts a single CFast 2.0 memory card. Connects to a computer via USB-3.For more details, click here. 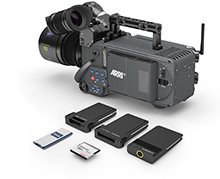 An adapter that fits into the ALEXA XR Module for holding one SxS PRO or SxS PRO+ card.For more details, click here. Small size, high performance, high reliability professional grade memory cards.For more details, click here. 200 mm optical viewfinder extension.For more details, click here. 295 mm optical viewfinder extension.For more details, click here. With this adapter the ALEXA Studio optical viewfinder OVF-1 can accept a number of ARRICAM eyepieces and viewfinder extensions.For more details, click here. 8x eyepiece Compatible with ALEXA Studio and ALEXA XT Studio OVF-1 and ARRICAMs.For more details, click here. 150 mm viewfinder extension.For more details, click here. A heated eyecup with 2 power settings for ALEXA Studio and ALEXA Studio XT optical viewfinder and all ARRICAM and ARRIFLEX eyepieces.For more details, click here. A heated eyecup with 2 power settings and an automatically closing element that fits all ARRICAM, ARRIFLEX and ALEXA Studio eyepieces.For more details, click here. All you need to use the ALEXA Electronic Viewfinder EVF-1 on the ALEXA Studio or ALEXA XT Studio.For more details, click here. A heated eyecup compatible with the AMIRA MVF-1 (starting with serial number 2151) and the ALEXA EVF-1 eyepiece.For more details, click here. A small, lightweight and ergonomic wireless hand unit for focus, zoom, iris and camera remote control.For more details, click here. A compact and robust remote for all ALEXA and ALEXA XT cameras.For more details, click here. A special test chart and analysis software for measurement of dynamic range and sensitivity of digital cameras.For more details, click here. 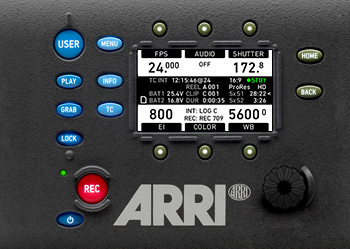 ARRI Pro Camera Accessories originate from the rugged world of traditional film cameras and mount natively on the ALEXA.For more details, click here. A low mode plate with numerous 3/8-16 mounting points, two tape hooks and optional feet. Compatible with ALEXA, ALEXA Plus, ALEXA Plus 4:3, ALEXA Studio (EVF-1 only), ALEXA XT, ALEXA XT Plus or ALEXA XT Studio (EVF-1 only).For more details, click here. 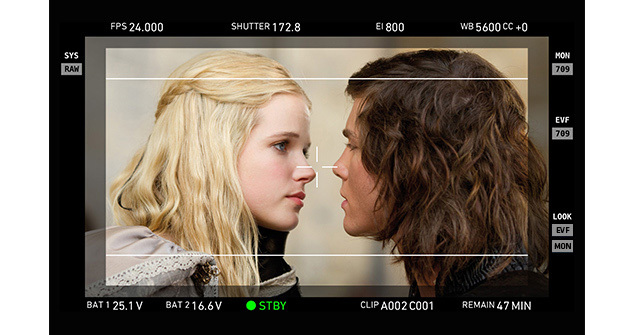 Extra feet LMS-3 use with ALEXA Studio or ALEXA XT Studio and Optical Universal Viewfinder OVF-1.For more details, click here. A rain cover custom designed for ALEXA, ALEXA Plus, ALEXA Plus 4:3, ALEXA Studio, ALEXA XT, ALEXA XT Plus or ALEXA XT Studio.For more details, click here. A set of 6 covers for the XR Module body and door in red, green, blue, yellow, black and white.For more details, click here. Carry and shipping case that holds one ALEXA Studio or ALEXA XT Studio.For more details, click here.